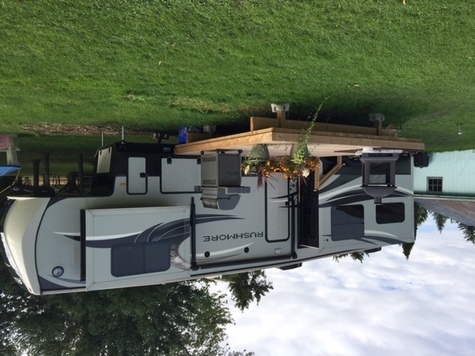 This trailer was purchased in Spring of 2018 for use during home reno.Trailer in immaculate condition. 4 tip outs. Self leveling. Spacious kitchen with central island and plenty of storage. Full sized fridge with ice dispenser. New washer and dryer. Relaxing living room with leather couches, electric fireplace and two TV's. Grand master bedroom with king-sized mattress. Lots of clothing and linen storage. Tons of storage underneath with outdoor awning and stereo speakers.